When you are hiking or backpacking, it’s safe to say that one of the things that you look forward to is having a nice, hot meal and hot coffee in the morning. If that’s the case with you, it goes without saying that you need to bring a stove in your outdoor trips. However, buying an outdoor cooking system is easier said than done, especially with the number of choices out there. Shopping for a camp stove depends on a number of factors. Do you want it to be lightweight? Boasting plenty of features? Do you need a system that boils quickly? Do you want a stove that won’t break the bank? In that case, it is highly recommended that you check out our BioLite Stove review. What’s the main purpose of this cooking system? What better way can you cook your food in the wilderness other than by using the BioLite Wood Burning Campstove? The BioLite camp stove was manufactured with one thing in mind, having your food cooked and ready to be used in the wilderness. This stove will cook your food using the twigs that you will have collected as you trek in the wilderness. This BioLite Campstove uses the patented BioLite’s thermoelectric technology to convert heat into electricity that powers a fan, making the fire ultra-efficient. The BioLite Campstove also has another very important purpose which is recharging your electrical gadgets in the wilderness. It uses the extra electricity that has been generated by converting the heat into electrical energy to charge small electronics like LED lights and cell phones. Just how useful this camp stove is? The BioLite Campstove is a handy cooking system because unlike many other camp stoves, it is unique in various ways. You won’t need to carry the heavy, expensive and environment polluting petroleum gas to fuel this camping stove. It is very easy to light this camp stove, and this will help you in saving a considerable amount of time you would have spent trying to light the stove. It boils food very fast and is also very easy to use. This stove has the capability of converting the heat from the fire in electricity that you can use to charge your gadgets like phones, lights among others as you prepare your meal. This will make sure that even though you will be in the wilderness but you all your electrical gadgets will still be useful. In case you might feel very cold in the wilderness, you can use this camping stove like a campfire by sitting around it and having fun while watching the flames dance as you roast marshmallows while telling stories with friends. Nano grid having a power pack, bright flashlight and LED camp lights. These accessories available in the package box are very important in making sure that you enjoy using this BioLite camp stove. The boiling pot will be very useful when you want to boil or cook something in the wilderness. The grill attachment on the other end will act as a barrier between the source of the flame and the boiling pot. The Nano grid has all that you need as far as your off-grid life in the wilderness is concerned. There is the power pack, the bright flashlight that you will need in the wilderness to see around in the dark and the LED camp lights to provide light at your camping site at night. The BioLite Campstove is designed from metal and plastic, has dimensions of 9 x 5 x 4.5 inches and weighs approximately 2.06 pounds. Most people would think that a camping stove crafted using plastic is not as durable When compared to models made from metal. However, the BioLite is made and designed to meet all your cooking needs in the wilderness. The plastic used in crafting the camping stove does not melt despite the amount of time and heat that the stove will be exposed to as you use it. Others have tested the durability of this camping stove to see how long it can be used without the plastic parts starting to melt. Surprisingly enough, the BioLite camping stove was able to beat all the odds and emerge the winner in the tests in that none of its plastic parts melted even a little bit. Even though at first glance the device may seem less durable and actually fragile, it is not in any way. Most people normally overlook camping stoves that feature plastic in their craftsmanship, but this cooking system is definitely an exception. Being made of plastic means that it’s a really lightweight stove especially when compared to metal ones. This camping stove is a very reliable one. It is very easy to set up. It will perform according to your expectations while in the wilderness as long as you’ll use it correctly. With just 46 g of wood, you will be able to boil one liter of water in the wilderness. In case you would want to make a quick call to a special someone back home, just 20 minutes of charge will enable to you make a call for at least 60 minutes. Even though the charging time varies by devices, this is the standard amount of talk time that 20 minutes of charge will avail you. Depending on the strength of the fire, this cooking system can take around 4.5 minutes to boil one liter of water. The performance is almost at par with the performance of the gas stoves. You’d expect the battery to be used to store energy for recharging electronic devices, but unfortunately, that is not the case here. The battery is used to only power the fan. The external USB devices can only be charged when the fire is burning and generating heat and electricity more than the amount required to operate the fan. This simply means that the fire must burn for you to recharge your USB devices. Overall, the operational performance of this BioLite camping stove is quite an exceptional one, though there are a few issues here and there that need to be addressed. The USB charging aspect is not very efficient yet because in some cases it takes long for the devices to be completely charged and others do not charge completely. When it comes to the overall value of this model, it ranks among the best ones, but it still has some room for improvement. Without including shipping and handling costs, this camping stove costs around $120. When the shipping plus all the other expenses are included, it should cost around $230 which is a quite a fair price considering that you will be spending your money on a quality device. 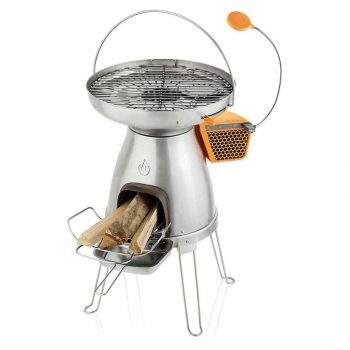 However, the BaoLite kettle pot and the BaoLite wood burning camp stove grill attachment do not come with the BioLite Campstove. The BaoLite kettle pot will cost around $50, and the BaoLite wood burning camp stove grill attachment costs around $60. If you spend your money to buy the BioLite Campstove with all the accessories all at once, then you will get the best value for your money. This is because you will have an all-rounded outdoor cooking system with very flexible applications. There is no listed guarantee at BioLites’ website at the moment, but in the future, it would be worth checking out to see what is available or contacting them personally to make an inquiry on it. On-board battery – The availability of the Integrated battery makes this device to be able to be able to have its fan operating and circulating enough air for better combustion. Lightweight aluminium legs-these aluminium legs are important in ensuring that there is enough portability of the camping stove. Honeycomb heat mesh-This is the protective barrier from inner burn chamber that is normally hot. USB charge with 50% more power-Updated thermoelectric technology creates, even more, electricity from the fire that will make sure that you are just alright living off-grid for some time. Scalloped pot stand– This is essential in accommodating the BioLite KettlePot, Portable Grill and other cookware that you might have with you in the wilderness. Same smokeless technology -Featuring 51 jets inside the burn chamber, enjoy smoke-free flames using the sticks around you. The BioLite BaseCamp Stove is another camping stove that is almost similar to the BioLite Campstove but also some few differences when the two are compared. This camping stove is ideal for a group of many hikers who want to prepare their meal together in the wilderness. This is because it has a 138 square inch grill surface that can easily fit 8 burgers. Using just small pieces of wood or fallen branches for fuel, this thermoelectric stove converts heat to electricity, which charges an internal 2,200 mAh lithium-ion battery and powers a fan to increase the efficiency of the fire. This camping stove measures 22.99 x 13.23 x 21.06 inches in dimensions and weighs 20 pounds. 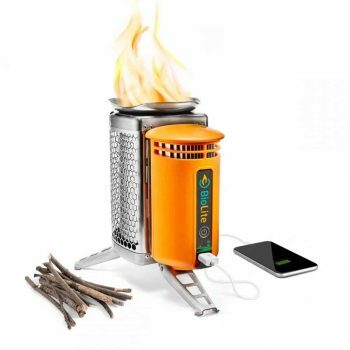 This camping stove uses wood fuel to operate which is very clean to the environment. This camping stove offers safe and energy efficient outdoor and off-grid cooking and heating. 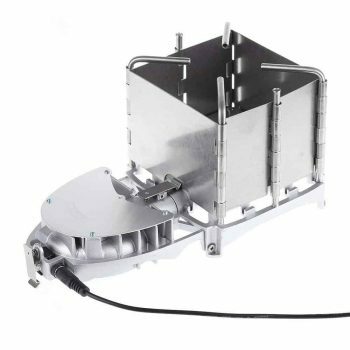 The BioLite BaseCamp stove has been manufactured using stainless steel, cast iron and high-temperature plastic. 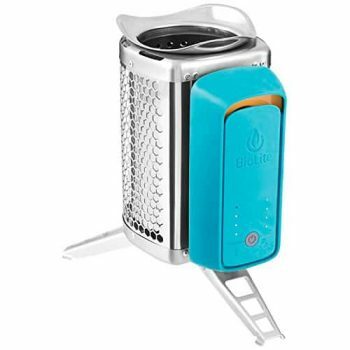 It compares to the BioLite camp stove in that both can be used for cooking and charging your electronic gadgets. It has a power pack with an on-board battery rated at 5 Watts and 5V USB output voltage to charge your electrical devices. Energy is stored with by the integrated 2200mAh Lithium-ion battery to use later, even without a fire. It’s another outdoor cooking system that will serve you well in the wild. The TaoKing Camoing Wood Burning Stove as the name suggests is the King when it comes to burning wood allowing one to cook some food in the wilderness. This camping stove has a very strong flame and is suitable for those hikers who would want to prepare their food within a very short duration of time. It has a blower system designed with a cover plate that protects the ventilation system and offers very strong firepower. This TaoKing Camping Stove meets the demand of all kinds of cooking. What’s more, the air outlet in the plate is evenly distributed, making the fire power stronger. It has a standard USB 2.0 interface which can connect with all kinds of power supply. It is worth noting that the fire power can be adjusted. The design of the plate bottom also has an overhead making the firewood in the combustion chamber to be fully exposed to oxygen. It is also very lightweight and compact. It compares with the BioLite Campstove in that both are eco-friendly because they leave less carbon footprint and the fuel they use is easy to get, just use twigs, branches, leaves, firewood to cook a meal. In both cases, one would say goodbye to heavy, costly, polluting petrol fuels. It costs approximately $39.99. The Biolite CookStove is another camping stove that works almost in the same way as the BioLite Camp Stove. It is fueled by renewable biomass which includes twigs, pinecones, wood pellets among others. This camping stove will take approximately 4.5 minutes to boil 1 liter of water. With a power output of 5 watts at peak sun, this is the kind of camping stove that most hikers would love to use while camping in the wilderness. Another serious issue that most campers would like to know before buying a camping stove that this camping stove has addressed is the cooking time. Well, the cooking time is as follows, turbo (4) 10 hours, boil (3) 20 hours, and simmer (2) 25 hours, campfire (1) 30 hours. The battery charge time is approximately 1.7 hours when using a wall outlet. There is a great feature in this device in that the fan can be recharged using a USB. This is what makes the difference here and allows this camping stove to be above the rest. The fan is responsible for accelerating air in the burn chamber thus getting things hot and burning very fast. An issue that needs to be addressed about the CookStove is that it is too heavy for backpacking. It also seems not to charge itself which is not something that campers would like to hear. This CookStove is similar to the BioLite Campstove in that both use the renewable source of energy which is wood. Both also feature a USB power charging mechanism to charge your electric gadgets and some fans, making the devices very efficient. This is a device that most outdoor enthusiasts would love to give a try as well. The BioLite Campstove is one of the camping stoves available on the market right now that is very easy to use. This is the perfect camping stove that any camper whether a seasoned camper or a newbie would love to use. It has some of the great features that you would expect a camping stove to have. To summarize, here are some of the pros and cons of the BioLite Campstove that you should know. One of the easiest camping stoves to use. Uses readily available and free fuel which includes the twigs available in the forest. Does not pollute the environment as it uses green energy. Generates usable electricity for charging electrical devices. Performs very well, can only be compared to the gas stoves. A camping stove to use for those who have no knowledge to an extensive level of how they work and what they actually need to perform well. Fuel box is suspended above ground on a stand, so heat from fire does not sterilise soil. Burns wood fuel completely to ash. Requires very many hours of burning to charge a cell phone. It is very hard to light when you run out of the supplied lighting sticks, and your battery is dead. It is quite heavy for backpackers. Produces more soot and smoke than expected. Burns wood very quickly hence needs constant replenishment of wood. No power storage; can only charge USB devices when a fire is burning. The BioLite is currently one of the best camping stoves available on the market at such an affordable price of approximately less than $200. Considering the quality and features you’ll get, it’s safe to say that the investment is more than worth it. A camp stove can be a wonderful investment that keeps on facilitating your outdoor adventures for years to come. The BioLite Wood Burning Campstove is one of the most technologically savvy options on the market, and comes in a very clever design. There are a number of retailers available to choose from, if you decide to investigate purchasing this, all in all a super piece of outdoor fire equipment. At the end of the day you get what you pay for with outdoor equipment and though it’s on the expensive side, this camp stove is well worth it from our perspective. The technological aspects of it will no doubt make it a fun and useful piece of camping equipment that you’ll use often for years to come. Its fire burning is clearly fantastic too. If you’ve tried the BioLite Campstove before, let us know in the comments below! Have you bought and used this product? If yes, then your input is highly valuable to us. Give us your opinion (If it performed as advertised, how quickly you got a fire going, if you managed to cook or charge your phone with it) in the comments section.